Connie's World Adventure! 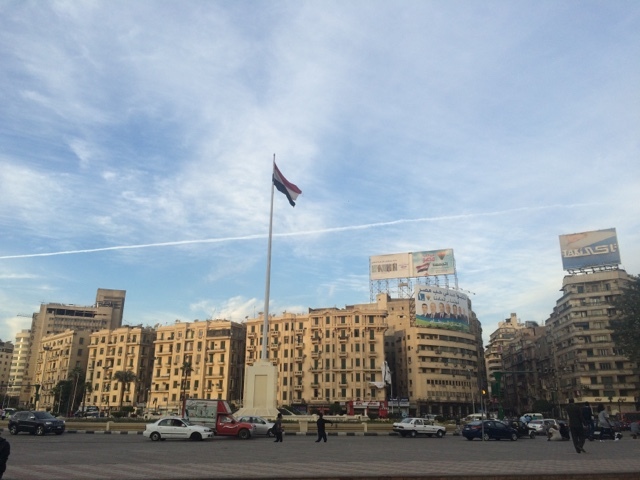 : Cairo, Egypt, Part 2: Egypt is Safe! Ok maybe I shouldn't write that title, mainly because I feel like I'm inviting trouble that way. Knocking on the wooden back of my chair as we speak. But I wanted to start my blog post today about the safety of being a girl by myself traveling through Egypt, because I feel like that's the number one question I've gotten. It's been pretty well-publicized that the Middle East may not be the safest place to be right now. 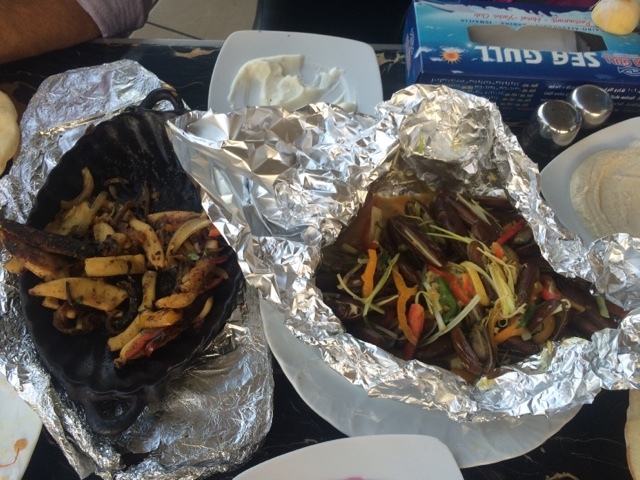 I started out uncertain about how long I was going to stay in Egypt after Thai & Maria left. I was waiting to feel it out - if it didn't feel safe, I was planning on heading somewhere else. 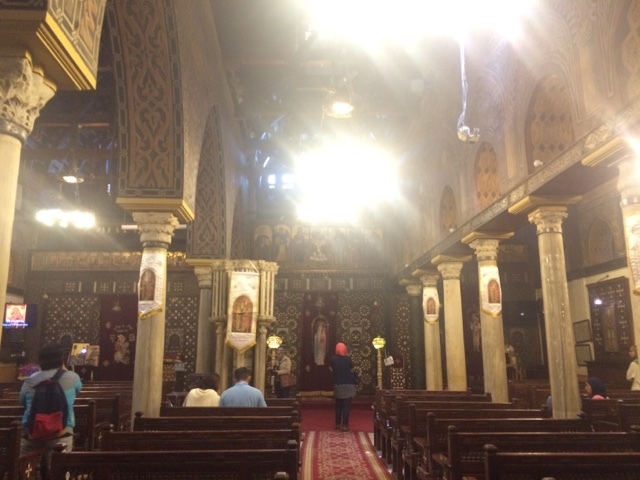 But having spent the last couple of days in Cairo wandering around alone, not only have I totally felt safe, but I've met a ton of locals/tourists/Westerners who have all said it's a media problem that paints Egypt in a bad light. Yes, some parts of Egypt are likely not safe to be tromping around (cough Northern Sinai Peninsula), but for the most part, the rest of the country has been completely wonderful. Not only have not felt threatened a single time, but I've found the Egyptian people to be totally lovely. Yes, you will see metal detectors, checkpoints, and guards with guns everywhere - it's an adjustment, but you honestly just get used to it, and it seems like just a part of life after awhile. The thing that breaks my heart the most is how empty all the touristy things are, and how dying for tourists the locals seem. If you look around, you see remnants of old tour companies that have shut down, hotels that have closed, etc. It's so sad. COME TO EGYPT. Every day, I will hear at least one sad story from a local about the drop in tourism, with some imploring me to tell others it's fine. In fact, as a sad aftereffect, it seems some of the vendors are even a little more harass-y because they really need the business. As a small caveat - I will say that you will absolutely get stared at by the men here (and given you're really the only person who looks different than others, it's not hard to be noticed), but not overly different from Sri Lanka or other parts of the world where being a single female is rarer. To my surprise, however, I've encountered genuinely lovely and helpful locals for the most part. And it's encouraged me to stay here and explore more (because trust me, no one is more concerned with my safety than me). As a side note, I've met a lot of other tourists - and surprisingly, many solo females! (just none from the States). 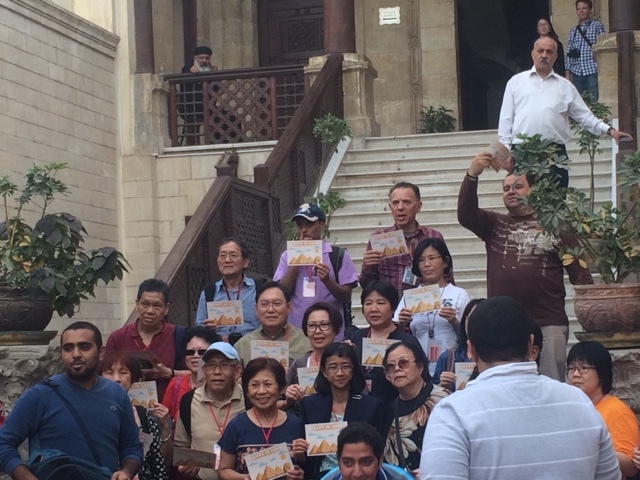 You can't see with the size of the photo, but here's a tour group - for their group photo, they are all holding signs that say "EGYPT IS SAFE", distributed by the tour so they can post the photo on their website. Break. my. heart. My first day alone, I laid low and organized a bunch of stuff in our fancy Marriott room (I was moving to a hostel that night, so I savored every last second of fancy life). Later, I met a guy named Eric - he's from New Jersey but currently lives in Cairo working as a journalist. 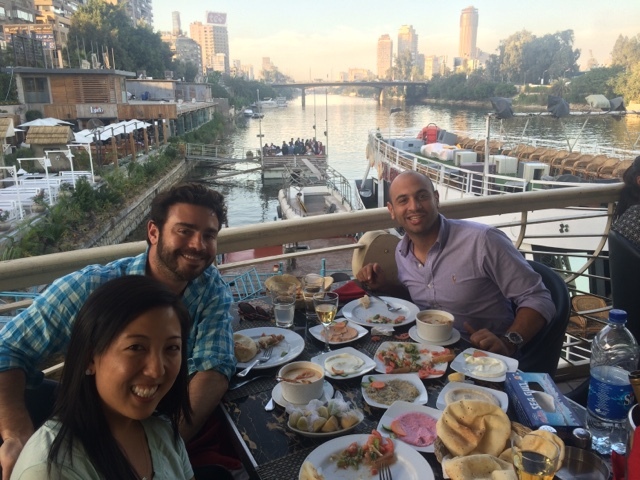 We sat on a terrace and had drinks - it was such a nice night out and I loved getting to hear about local Cairo life. I forgot to take a photo, but trust I don't need a certificate of authenticity. 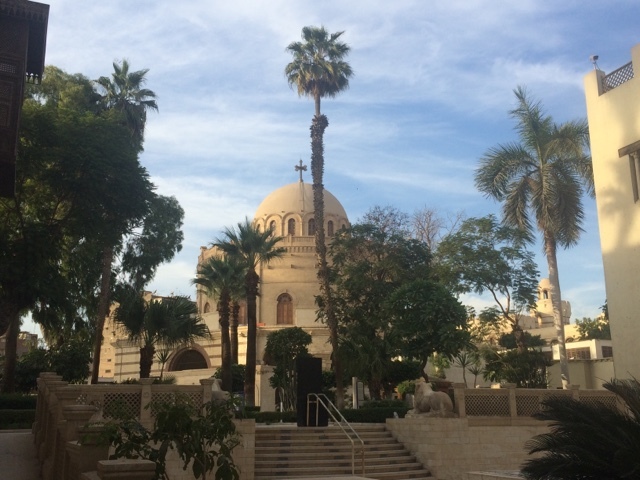 The next day, I went to go wander the Old City of Cairo, in an area called Coptic Cairo. 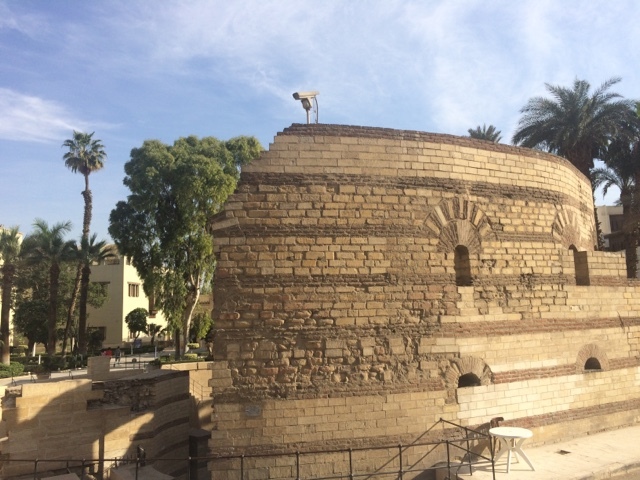 This area has tons and tons of churches, and is where the original Egyptians (called the Copts, who were all Christian - before Egypt became Muslim) lived and still do today. 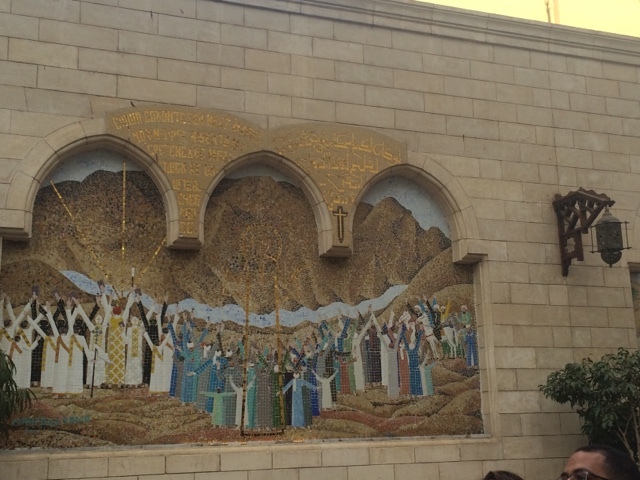 It is a neighborhood packed full of history (it was thought that Jesus, Mary and Joseph came to this area when escaping from Herod) and is super historic and cute to walk. Get ready for a million church photos. 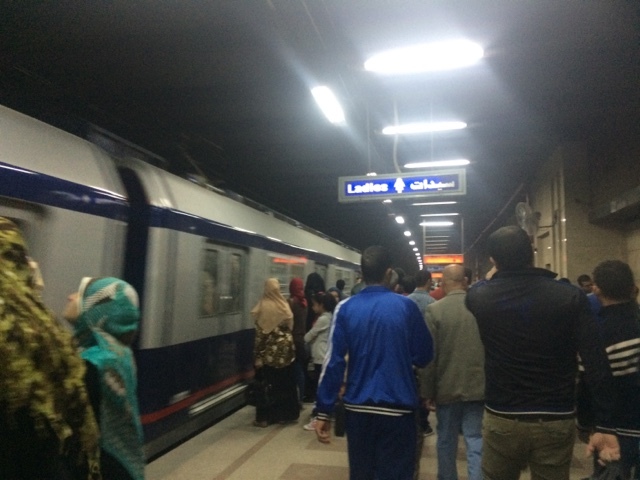 Getting to the Coptic Quarter also involved a fun little jaunt on the Cairo Metro. This is a terrible photo of what I discovered later is a ladies-only car of the train (INFO THAT WOULD HAVE BEEN HELPFUL EARLIER). According to the Lonely Planet - if you're a solo female and you're getting harassed - as consolation, it apparently happens to local women too. Thanks, LP. Also, not only did I NOT get harassed (I did get stared down though), but two separate lovely locals made room for me on the totally packed train and gestured for me to take their spots, both on the way there and back. I have now deduced that I must constantly look very helpless. 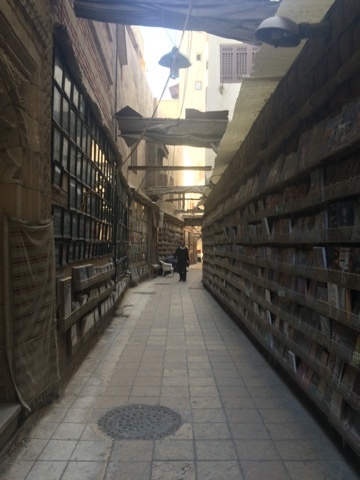 And here are the cute narrow passageways of the Coptic quarter! 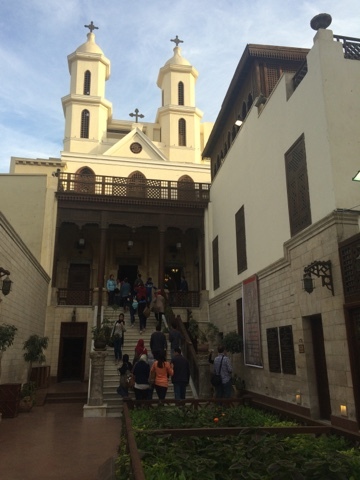 Church of St. George. 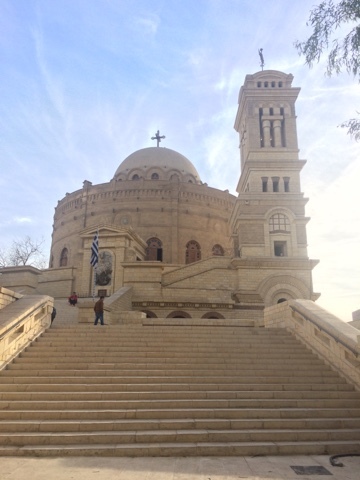 I think this was a Greek Orthodox church. I fail at religious buildings. 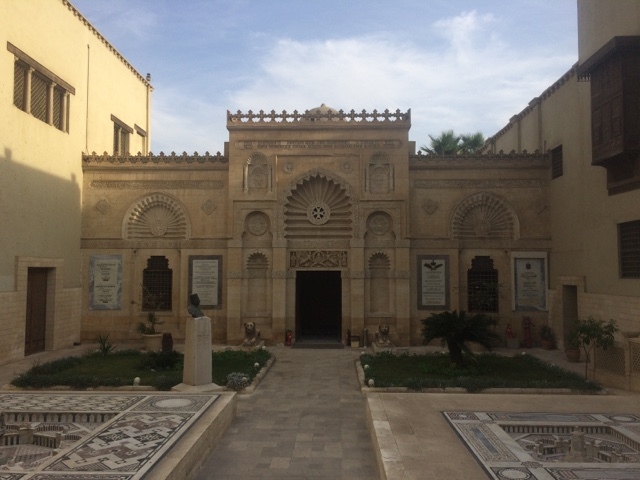 And then I somehow got roped into the Coptic Museum. I didn't even know what it was but was suddenly ushered in. This museum was HUGE and housed tons of artifacts (buildings, reliefs, paintings, clothing, materials, etc.) 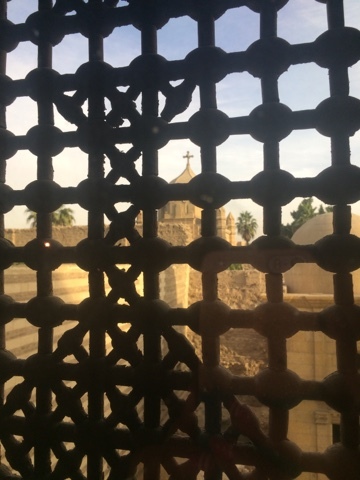 from the Coptic people. It was actually really cool because since this stuff pre-dates all the Muslim stuff, it is REALLY old. 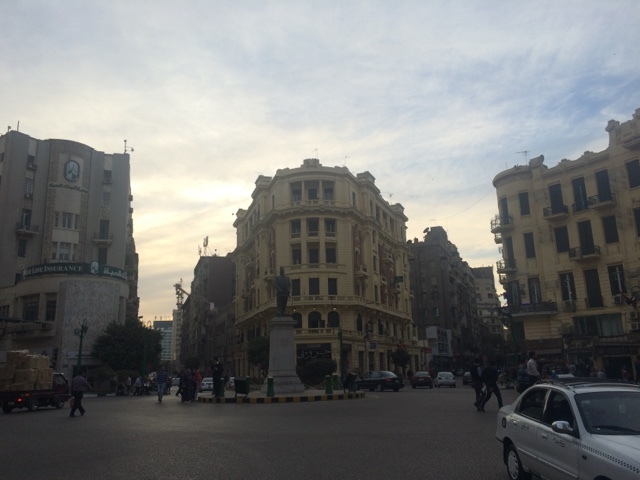 After being inundated with churches, I headed back to downtown Cairo - the sun was setting and it was gorgeous. 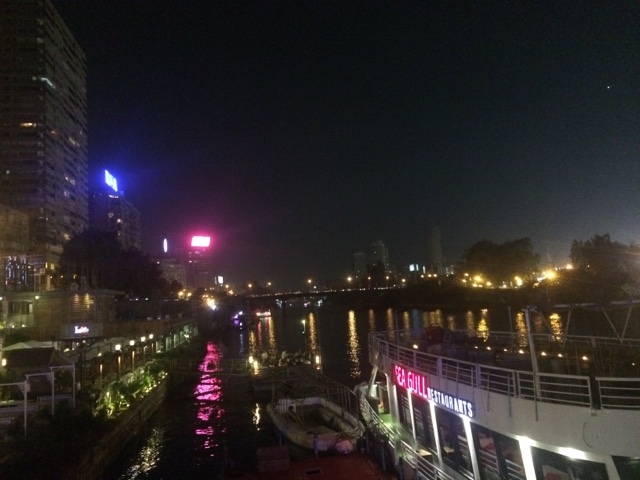 I went to dinner with some guys from the hostel at a local joint nearby, then met up with Eric (from the day before) to go to a Cairo jazz club. It was super cool (there were all these cover bands, the last of which seemed to have a Maroon 5 obsession) - and I loved getting to be somewhere "local." Small side note, it's super weird being somewhere where people are allowed to smoke indoors again. Streets of Cairo at sunset (which actually makes the city look really nice, if I do say so myself. Now imagine garbage and weird crumbling buildings down every other road you turn down). The next day, I spent making plans for the rest of my time in Egypt (I made the decision to stay for the entire two weeks before heading to Tanzania because there's SO MANY things I want to do in Egypt still + I feel totally safe being here). That night, one of my hostel roommates, Mauricio, invited me to dinner with some of his local friends. Mauricio is a lawyer from Brazil (but more currently living in London), and has a local Egyptian friend named Mohamed: they went to law school in London together and Mohamed is now a local judge in Cairo. 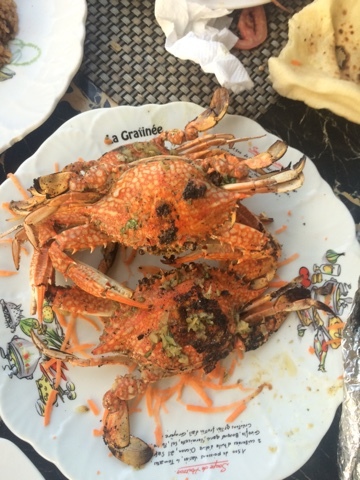 Anyhow, we went to the world's most delicious seafood restaurant, called Sea Gull, which is located conveniently on the Nile River. And we got a baller spot on the patio right on the water. Mauricio (next to me) and I just let Mohamed (a Cairo local), order everything. Which meant Mohamed ordered like 15 courses of seafood. It was out of control. You get a crab! You get a crab! EVERYONE GETS A CRAB! This really doesn't look that appetizing, but it was delicious. 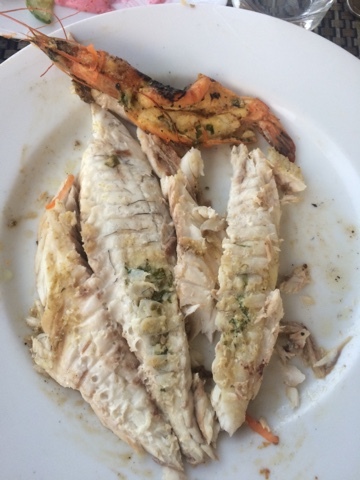 Mohamed went down to the kitchen and personally chose each of us a fish. 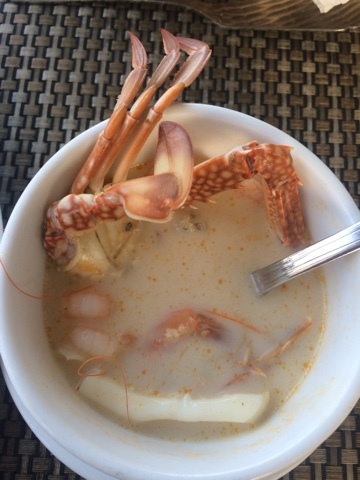 At the top is a shrimp, of which there were two entire plates full of (seasoned differently). I almost died of overeating. It was one of those great, great nights - good food, good company, and totally random. I didn't know Mauricio that well, but ended up at a dinner with him and friends on a boat eating seafood (some friends of his law school friends showed up later, and they were the greatest, funniest girls). Nights like these are just another reason I love to travel. The sweetest thing was that Mohamed secretly paid the bill without us knowing - I felt like a total freeloader given he was just probably trying to treat his friend (and not the hanger-on), but he rebuffed all my attempts to pay. Egyptian elevators = no doors. Unless you're at a fancy hotel. Otherwise, get used to seeing the floors zoom by maniacally while going up or down floors. On that note, most of the apartment/business buildings here look a little murder-alley-esque on the inside. Like my hostel is on the 4th floor of this very murder-y looking building - the inside is full of dusty staircases, cobwebbed windows, rando broken furniture sitting in the corner, trash, homeless people, (ELEVATORS WITHOUT DOORS) - but when you enter the actual hostel, it's like another world. 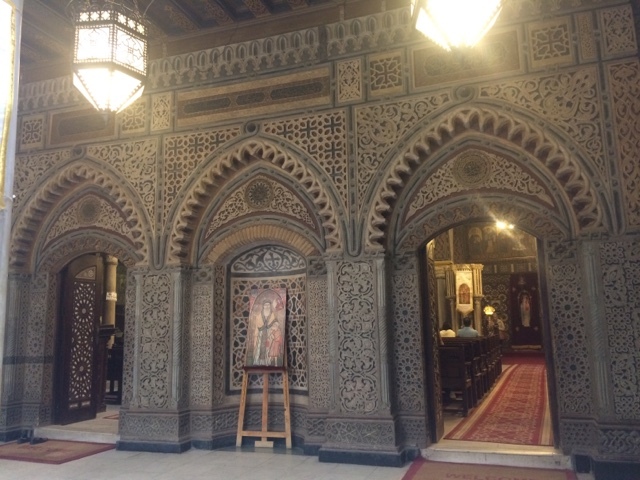 I've found this is fairly standard for Cairo, and kind of the norm here. Which contributes to the fact that Cairo is just not a very pretty city from the outside. But it has definitely grown on me.